Beautiful Ocean front 3rd floor south end unit, 2 bedroom, 2 full baths, best view on island. You can see all the way to Kure Beach! Sunbathe from open porch overlooking ocean or relax on back porch facing harbor. See sunrise from your private balcony. Wonderfully maintained apartment that is beautifully decorated with newer kitchen appliances. Recently renovated with wood & ceramic floors throughout the condo. Brand new HAV system & water heater. Everything to make your stay enjoyable. Sleeps 6-7 comfortably. Queen size bed in master bedroom, full & twin beds in second bedroom. Queen sleeper in living room. All you need to have a relaxing & fun vacation. Choose from lying or walking on the beach to playing in the 2 pools available for your use. Located in well maintained Sun Skipper complex on desirable north end of beach near fishing pier, quiet even at height of season. Hope you enjoy our home. Dishwasher, Maytag side by side Refrigerator, microwave over stove, disposal, all updated. Central Air Conditioning Dishes, wine, margarita & water glasses, silverware, pots & pans, utensils. blender, toaster, coffee maker. Fully furnished kitchen. Washer & dryer in hall bathroom which has full bath. Master bedroom has shower. Living room & master bedroom has TV with blue ray players. Queen sleeper couch in living room. Ocean front balcony, outdoor pool. 2 covered parking spaces. Renters need to provide own linens & towels. We can arrange for rental. This property is right on the beach and on the quieter end of the island. Bill is very helpful and a pleasure to deal with. I wouldn’t hesitate to book this property again. We had a great time overlooking the ocean from the balcony and living room. Bill Levison was great in taking care of us and answering all our questions. Quiet complex! Great value for oceanfront property! Very surprised to be one of only 3 families staying in the complex in mid-July! We really enjoyed mornings inside watching the boats and evenings on the balcony watching/listening to the ocean. Bill was wonderful...made sure everything met our expectations with the accommodations and was quick to answer any questions that we had. Thanks so much! We hope to get back before next summer! Great experience, loved that you can see the beach as you first walk in. Bill was very kind, accommodating and easy to communicate with as far as logistics went. Would like to come back soon! On the water, comfort away from home! Thank you to Bill and Sandi for allowing us to stay at their condo. 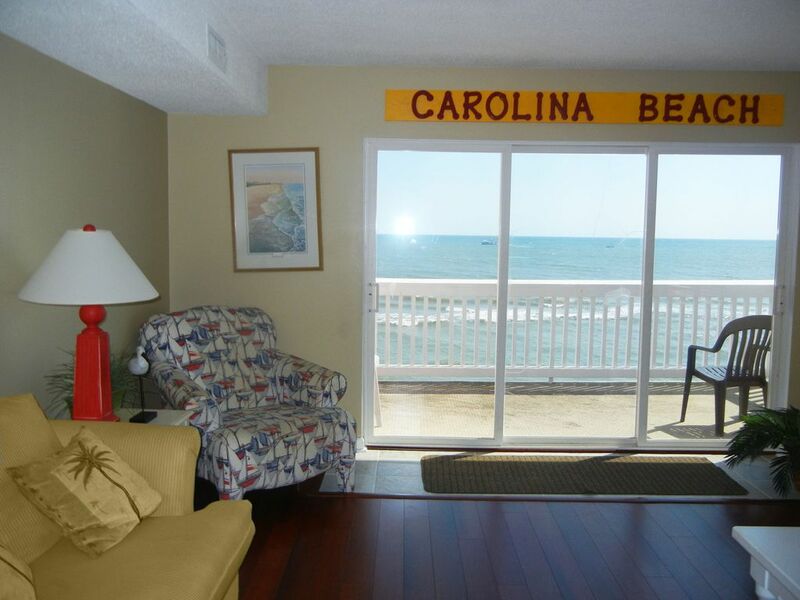 This condo is right on the water (ocean front balcony), and just a few steps to the beach making beach time super convenient! We had a little one with us, and Bill was very communicative leading up to our stay to help us ensure we had everything needed prior to arriving. The condo has a nice large balcony that was nice to sit on and watch the sunrise/set, a full kitchen, and two bathrooms. Parking was also very convenient being right under the condo. Carolina Beach Boardwalk is about a 30 minute walk or a short 3-5 minute drive. Which, we enjoyed being a little north "From it all," because our beach area was much less crowded other than other families/guests around us. Highly recommend, and will definitely be back!